Pedestrian advocates exactly a century later will be happy to know that our 19-year-old anti-hero, Harold Bracken (son of a saloonkeeper! ), was fined by the court $200 for knocking over a pedestrian on Michigan Avenue with his speeding car. An equally awesome detail: Our injured pedestrian got up, jumped into a passing car, caught up with Bracken and had him arrested. In doling out the fine, a municipal judge declared, "The Streets of Chicago belong to the city, not to automobilists." This is, in short, the guiding philosophy for how Chicago’s Department of Transportation is now planning to look at all of its projects. A local judge may have expressed the sentiment a century ago. But in reality, in the Second City – as in just about every American metro – autos have long dominated city streets and how we think about who uses them, why they exist and what defines them as successful. 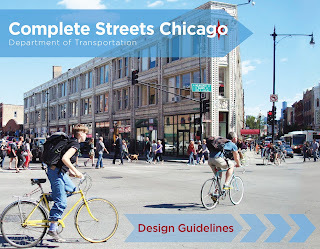 This summer, though, Chicago is planning to roll out a small-sounding but seismic policy shift: From now on, in the design guidelines for every effort from major streetscape projects to minor roadside electrical work, transportation work must defer to a new “default modal hierarchy.” The pedestrian comes first.